Have you been lately suffering from low or reduced vision at night and a progressive inability to view objects at your sides? You may be suffering from an eye disease known as Retinitis pigmentosa (RP). Read and know all about this ocular condition and get to learn about its possible causes, symptoms, diagnosis and treatment options in detail. It refers to an eye disorder characterized by damage to the retina, the tissue layer situated at the posterior area of the inner eye that converts light images to nerve signals and transmits them to the brain. The ICD9 Code for this disease is 362.74. This is a rare disease and affects only around one out of every 4,000 individuals in the United States. About 1 out of every 100 RP sufferers is assessed to be a carrier of associated genetic abnormalities that could be transmitted and could be manifested as RP in succeeding generations. The exact causes of this condition have not been fully determined or understood. The disease has been found to run in families and is hence, supposed to arise due to a number of genetic defects. The condition typically affects the rods, or the cells that are responsible for controlling night vision. In some cases, however, the retinal cone cells are found to be the most damaged. 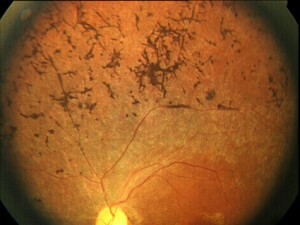 The presence of dark deposits in the retina is the primary symptom of this condition. Around 70 varying types of genetic defects have been identified that lead to the development of different forms of RP. A family history of this disorder is the main risk factor for RP. Medical researchers have not yet conclusively proved the association of any other factor with this disease. The name of this condition is supposed to have partially originated from the tendency of the retinal epithelium to break down at the time of degeneration. With the progression of the disorder, the rods (cells which convert light waves to electrical impulses are affected first. This leads to loss of low-light or night vision. The rods are also responsible for providing a peripheral (wider) field of vision. With the deterioration of these cells, the peripheral vision may suffer deterioration until the patient is only left with “tunnel” or “straight-ahead” vision. The problems associated to this condition first become apparent in childhood. However, acute problems in vision do not generally manifest until patients are in the early years of their adulthood. In the majority of cases, sufferers first report of progressive loss of vision at nighttime (Nyctalopia) or even complain about night blindness. Affected individuals may also complain of a complete loss of vision in low light. The vision field may slowly reduce until the central sight is only retained. In the course of time, color perception and central vision may also begin to worsen. A few sufferers may first lose central vision and perception of color. The gradual deterioration in visual capabilities may occur over a period of several years. 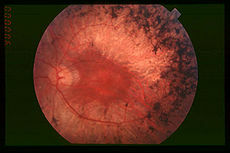 Cone-Rod Dystrophy is a type of RP that initially affects the central vision of its sufferers. Contact lenses or glasses fail to correct this eye problem. An RP patient may also lose the capability to perceive color. With the progression of the disorder, sufferers also lose their peripheral vision and suffer from night blindness. The condition is initially detected by a physical examination. An illuminated apparatus, known as the ophthalmoscope, is used to magnify the interior section of the eye. In RP sufferers, ophthalmoscopy helps reveal mottling of the retina and a typical “bone-spicule” development. In patients, doctors also look for narrowing of the retinal arteries and a yellowish, waxy appearance of the optic disc. Some other tests may also be performed to ascertain the absence of underlying conditions like neurological abnormalities or venereal disorders that might be the actual cause of the problems experienced by sufferers. The disorder does not have any effective cure. Patients may wear sunglasses to protect their retina from ultraviolet light which may help in retaining the vision. As per some studies, use of antioxidants (such as Vitamin A Palmitate in increased doses) may help in retarding the progression of the disorder. However, intake of this substance in high doses may result in acute liver problems. Physicians should weight the benefit of medical treatment against the risks to the liver. Various clinical trials are being conducted to detect new cures for RP, including Omega-3 fatty acid. Researchers are in the early stages of determining the benefits of DHA microchip implants that enter the retina (and act as a microscopic video camera) for curing associated blindness and other acute conditions of the eye. RP patients should get in touch with a low-vision specialist to adapt to loss of vision. Sufferers should make frequent visits to eye care specialists who can determine retinal swelling or cataracts, both of which can be cured. At present, research is being carried out to determine whether or not prosthesis would help replace a natural retina that has been permanently damaged. Researchers are currently investigating the usefulness gene therapy (replacement of defective genes responsible for the disease) in curing the disorder, although it has not been tested on any human subject. Certain researchers have reported of positive results with Hyperbaric Oxygen Therapy. The process involves the application of decompression chambers that deliver pure oxygen to cells inside the retina at high pressure. The therapy may help stimulate or preserve undamaged regions inside the retina, although there is no proof of improvement of already damaged visual acuity. Low vision aids, mage intensifiers and dark sunglasses may be used as supportive measures for the improvement of patients affected by the disease. Yellow-filtered lenses are supposed to aid in enhancing the ability of affected individuals to view contrast. In advanced cases of the condition, surgery may be needed to correct complications related with RP such as cataract formation. Operative procedures usually involve intraocular lens implantation and cataract extraction. Patients may also derive some benefit from genetic counseling and getting in touch with agencies that render services to people who are visually impaired. Following treatment, patients need to make some changes in work and lifestyle to accommodate the problem. The nature of changes depends on the type and extent of vision loss in affected individuals. In some cases, patients may be unable to work or drive at night. A patient of RP may need dark sunglasses to work outdoors in certain cases. Some others may need use of yellow-filtered lenses to enhance vision contrast. In some individuals, supportive measures like larger print or magnification and contrast accommodation might be needed. Workplace might need more lighting to be illuminated for RP patients suffering from vision problems in low-lit environments. Some sufferers may need closed-circuit television readers. The condition continues to worsen and leads to complete blindness, although only rarely. Eventually, central and peripheral loss of vision may occur. Patients of Retinitis pigmentosa, who undergo cataract operation, tend to lose more the power to view contrast. As a result of this condition, Glaucoma may occur. Cystoid Macular Edema, or inflammation of the retina, may result in complications. If cataracts contribute to vision loss, they can be removed. There is no way to prevent this disorder. However, couples planning pregnancy and with a family history of the disease or suffering from RP themselves can seek genetic counseling and testing to find out whether their children would be at risk of developing this disorder. Gene therapy may have a future role in the prevention of this condition. Take a look at these images to know how RP affects the vision of its patients. You would find these diagrams assistive in getting an idea of the ocular appearance of people who are affected by this disorder. If you are suffering from one or more of the problems caused by Retinitis pigmentosa, it is recommended that you get in touch with an optometric physician at the earliest. Early diagnosis and treatment can help slow down the progression of this disorder and improve the condition of patients.